Here we go again!! And just in time for Easter!! 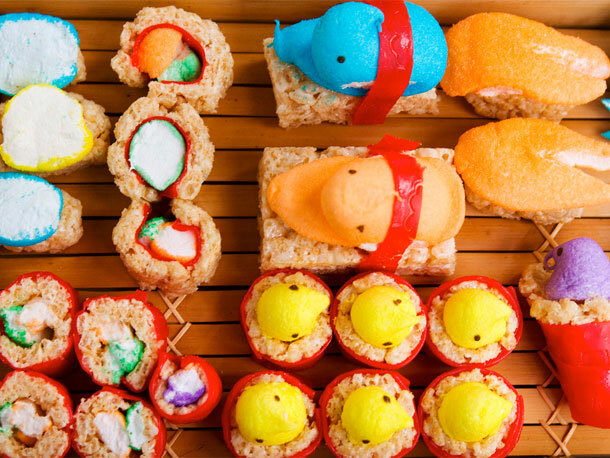 This morning, my sister Shana “Pinterested” me on FB with a pic of “sushi” made with rice crispie treats, fruit roll-ups and Peeps!! So, you know that I had to try to find the “recipe” to share this cute and novel food idea! Now, I don’t think I would venture to try these as I’d probably get a sugar headache and go into a diabetic coma from one piece! But, I’m sure it’s an idea that the kiddies will love as a special treat one day of the year. Just don’t invite me to your house when you serve them;)!! LOL!! 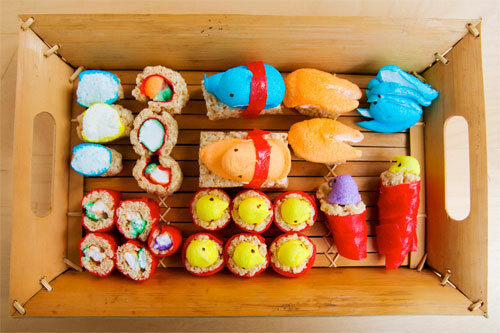 Anywho, here’s a link to the “How to” to make Peepshi (i.e. Peeps Sushi) on Seriouseats.com. Enjoy!! you find some interesting desserts. still loving the fries / cake version. Yeah, the fries cake/cupcakes is so much more awesome than this. Those, I would TOTALLY eat. This, not so much. But, I thought it was so cute and clever for Easter:).